Properties in W.O. Riley Park average 4.7 out of 5 stars. Property 4: Secluded Mountain Home! Spectacular Views! Hot Tub! Only 100 miles from DC! Deal buy 3 nights get the 4th night free!! WiFi! New Luxury Mattress!! Property 7: Deal buy 3 nights get the 4th night free!! WiFi! New Luxury Mattress!! Property 16: 2015, 2016 & 2017 VA Green B&B award winner! 5 Star-Happily Sleeps 1-4 adults! Glamping at it's Finest! -WATERFRONT on the Shenandoah River! Open Year Round! Property 17: Glamping at it's Finest! 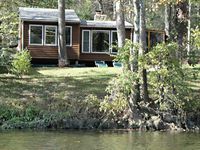 -WATERFRONT on the Shenandoah River! Open Year Round! Come enjoy your private getaway amongst the Mountains and River. Property 20: Come enjoy your private getaway amongst the Mountains and River. Property 21: HEAVEN'S VIEW WHERE NEW MEMORIES ARE MADE!! Property 23: Pet freindly cabin 50 yds to private river access. Close to major attractions. Property 26: Riverside is just 98' from the river great fishing, kayaking, hiking & more! Cozy condo facing the slopes-Great get away. Property 28: Cozy condo facing the slopes-Great get away. Property 29: Perfect Winter Getaway! Wood Burning Fireplace! Hottub! Sunroom! Property 32: Breathtaking Views and modern amenities on the side of the mountain! Property 37: Cozy condo facing slopes, great get away, sister condo next door. LIFE IS BETTER AT THE SHENANDOAH RIVER AT OUR COZY RIVERFRONT COTTAGE!! Property 41: LIFE IS BETTER AT THE SHENANDOAH RIVER AT OUR COZY RIVERFRONT COTTAGE!! Property 42: Charming Country Home, Beautiful Mountain Views, Near Vacation Activities. Property 45: Picturesque Ski Slope, Mountain & Golf Views; Minutes to Lake Laura. Riverfront Cabin Large Private Lot! Canoe! Kayak! WIFI! Hottub! Property 48: Riverfront Cabin Large Private Lot! Canoe! Kayak! WIFI! Hottub! Our family enjoyed our stay. The cabin/house is cute and cozy. It had everything we needed for a quiet get away. We were doing an unplug vacation but they do have wifi and tv. We spent our time fishing, playing horse shoes, board games and around the fure pit. My husband and I enjoyed sitting in the hot tub after my son went to bed which is located right outside the master bedroom. The views are beautiful. We would defiantly stay here again. The only drawback was it was not secluded. This one of our favorite cabins in Lost River. The kitchen is well stocked, there is high speed internet, central air, a screened porch, and a gas grill. Everything we need is always stocked and the owner is super responsive if something runs out. 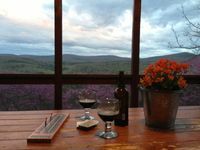 Being on the mountain top makes for quiet nights and great views of the sunrise and sunset (you have a better view of the sunrise at this cabin). Lost River is mostly a weekend town with many businesses in the immediate area closed during the week. The Lost River Grill is open all week though and offers good food at a good price. And on the weekends the Guesthouse opens and is definitely worth booking a dinner reservation, the food is always excellent and the owners are great. The main attraction is the wealth of outdoor locations within driving distance, We usually visit Lost River State Park at least once a trip and other hiking areas are abundant in this part of WV (Seneca Rocks and Dolly Sods for example). Overall wonderful place.